The Tea Lover's Devotional by Emilie Barnes was published in 2009 by Harvest House Publishers. I purchased my copy when it was released and have enjoyed it. I was very pleased to see this little book on the shelf of an Atlanta airport book store/news stand recently, readily available for travelers to purchase. The book includes easy-to-read devotionals, recipes, and interesting tea facts. If you enjoy Emilie Barnes tea books, or if you are looking for an uplifting book of devotions, I believe you will enjoy this precious little book. 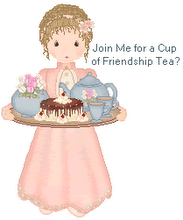 I have If Teacups Could Talk, The Twelve Teas of Christmas and The Twelve Teas of Friendship. I have enjoyed these books, as well as the art by Clough and Rios. I will have to look for The Tea Lover's Devotional. Thanks. I have put that book on my wish list! I love devotionals, anything by Emilie Barnes, and of course tea, so this sounds like something I really must get, doesn't it! Hello. I'm so glad I stumbled onto your blog. This book looks like a must have.